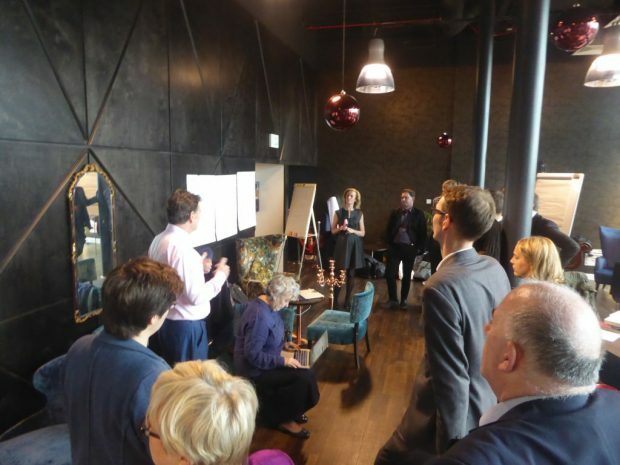 The 17th meeting of the Libraries Taskforce took place on 7 December in Storyhouse - the new combined library, theatre, cinema and restaurant in Chester. The meeting took a different format from usual, as the Taskforce had agreed some time ago to set aside the time to focus on longer-term strategic issues. Also, as it was almost exactly a year since we published Libraries Deliver: Ambition, it was a good opportunity to both look back, and reflect on what had been achieved, and forwards - setting out any new priorities. share views and reflect on how the Taskforce is operating and the impact it is having on the ground, particularly bearing in mind the findings from a survey in which we sought feedback on the Taskforce’s work and its impact at grassroots levels. Minutes of the meeting will be published on GOV.UK. Before the main business of the meeting, however, we had the opportunity to tour the building from top to bottom, and were accompanied by Rachel Foster, Head of Library Service, and Alex Clifton, the Artistic Director at Storyhouse. They shared the story of how the project started and was developed, and the many services and opportunities it offers to the wider community. Described as an ‘anchor tenant’ for the redevelopment and regeneration of that area of Chester, it forms a neat trio as you look out the windows at the cathedral - representing the spiritual centre, City Hall - the civic centre, and Storyhouse - the cultural centre. Development had been achieved through having strong champions at both councillor and officer level, and a clear vision to hold the project together. The vision is based on building relationships with local communities and delivering what they wanted - in particular, engagement with hard to reach communities. The building, although striking, was only the framework to deliver and support these services. The wider library network was also being used to spread some of the cultural opportunities further across the area, and the project was also being used as a springboard to provide programmes of creative learning, children and young people’s programmes, and community co-curation of events and festivals. The £37m build cost was funded by a mix of capital reserve from Cheshire West and Chester council, plus support from Arts Council England and MBNA - a major local employer. Elements of the programme have also attracted funding from major trusts and foundations, including a multi-year donation from the Oglesby charitable trust, to kick-start a major element of the community programme. Service hours are 8am to around 11pm (whenever the last performance ends), and they have smashed their original annual target for visitor numbers in the first 6 months! They aimed for 450,000 and have achieved over 500,000 already. One thing that you notice when moving around the building is how all the spaces are fully integrated - there are no lockable doors. It is easy to move between library, cinema and the 2 different theatre spaces. All staff are able to help with questions in all areas, and have been specially trained to help with people with specific needs, so the building is both autism and dementia friendly. It’s also clear how the staff were determined to provide a high-quality environment for their community - from the furniture and decoration, to the great customer service. As Alex said: our community deserve the very best we can provide. We started in the Garret Theatre and Bar (where our meeting was held). This space is in the modern addition to the art deco cinema (which forms the main body of the building). It’s a flexible space, with tiered seating that folds away when not needed. Priority use is given to organisations working with community groups - in particular, those with a focus on young people who have a range of different specific needs. Groups from the university also use it, and there is a programme of shows. 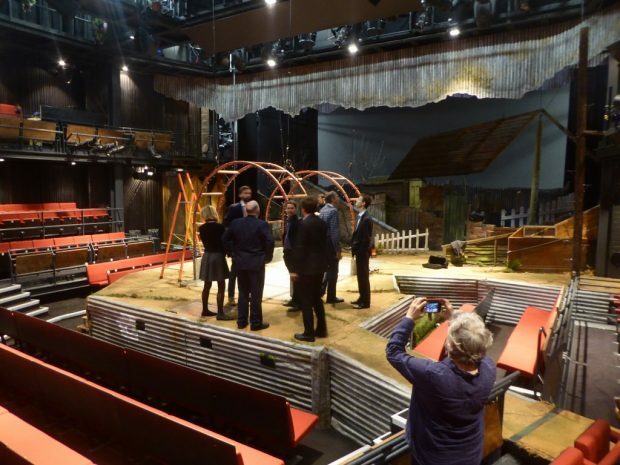 We moved then into the main theatre space, where finishing touches were being put to the stage as a production of the Secret Seven was due to open that evening. This is also a flexible space containing up to 800 seats but, when we visited it, the stalls were hidden and the stage was built over them - leaving around 500 seats. Ticketing policy aims to equalise access. Those who book first get the best seats - at the cheapest prices, and there is a wide range of reduced price and free tickets available for different groups. The third performance/entertainment space is a 100 seat cinema. Created in a ‘box’ at mezzanine level in the former cinema, it too is community focused, with a number of screenings being curated by community groups. There are sessions for people with specific needs - eg. autism or dementia friendly screenings - as well as mainstream titles. Around the small cinema is the space once occupied by the original Odeon cinema. It contains a restaurant and open area which can be used for a range of things - from live screenings to performance to social activities. When we visited, there was a christmas wreath-making session in progress - next to a huge christmas tree. 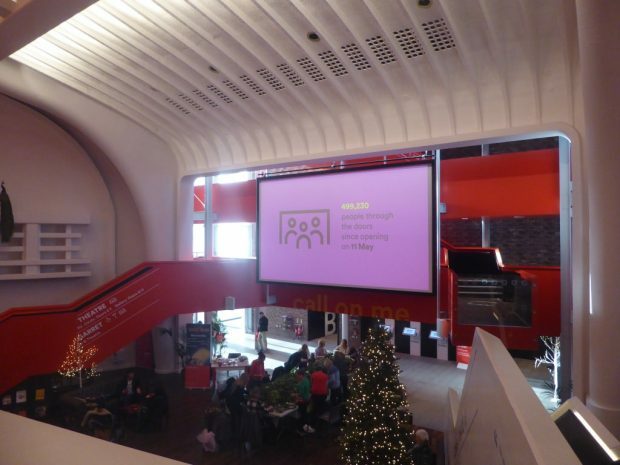 While we were in the community space, our attention kept being drawn to the large screen, which hangs in what was the space occupied by the original cinema screen. It was showing an animation produced to illustrate achievements of all parts of the building since they opened. The full video can be seen on Youtube. Aside from the performance spaces (those which actually have rows of seats installed), the rest of the building is library. 700m of shelves line the walls - plus there is a mix of study space, reading nooks and browsing space. There is a restaurant on the ground floor - where visitors can eat and drink surrounded by books. There were also poems everywhere. These will change, but the current selection were produced by Hollie McNish, who was poet in residence during the Chester Literary Festival. As Alex described it: "the building is both a stage and a page - and can evolve to reflect the taste of the city." A community room is available either for groups to use or for quiet study. As with the Garret Theatre, priority is given to groups who are inclusive. The children’s library has a very different look and feel from the rest of the library. At one end is a storytelling den, with a storytelling throne, secret window, woodland wallpaper and lots of soft cushions. At the other, a flexible area with sink and big tables which can be used for craft and creative activities. In between are lots of reading nooks, with informal furniture and colourful fabrics. There are lots of quirky details, such as the lights which feature monkeys climbing vine covered posts. The whole space was originally a row of shop units, which have been knocked through into a single, long room, keeping their large windows. Lots of food for thought as Taskforce members walked around and heard more about the vision for the building. It was certainly an excellent venue for a different sort of Taskforce meeting, and we’d recommend it as a place to visit. Storyhouse recognise that not everyone will have the substantial capital budget needed to produce a building of this scale, but there were lots of ideas that would work in even very small spaces that they are keen to share. Our next meeting will be in London in February 2018. Can libraries bring internet safety to life?